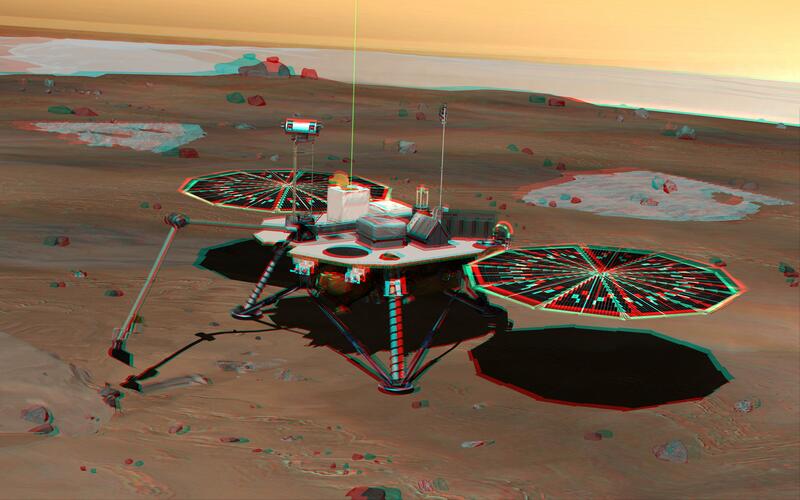 NASA's Phoenix Mars Lander monitors the atmosphere overhead and reaches out to the soil below in this stereo illustration of the spacecraft fully deployed on the surface of Mars. The image appears three-dimensional when viewed through red-green stereo glasses. Phoenix has been assembled and tested for launch in August 2007 from Cape Canaveral Air Force Station, Fla., and for landing in May or June 2008 on an arctic plain of far-northern Mars. The mission responds to evidence returned from NASA's Mars Odyssey orbiter in 2002 indicating that most high-latitude areas on Mars have frozen water mixed with soil within arm's reach of the surface. Phoenix will use a robotic arm to dig down to the expected icy layer. It will analyze scooped-up samples of the soil and ice for factors that will help scientists evaluate whether the subsurface environment at the site ever was, or may still be, a favorable habitat for microbial life. The instruments on Phoenix will also gather information to advance understanding about the history of the water in the icy layer. A weather station on the lander will conduct the first study Martian arctic weather from ground level. The vertical green line in this illustration shows how the weather station on Phoenix will use a laser beam from a lidar instrument to monitor dust and clouds in the atmosphere. The dark "wings" to either side of the lander's main body are solar panels for providing electric power. The Phoenix mission is led by Principal Investigator Peter H. Smith of the University of Arizona, Tucson, with project management at NASA's Jet Propulsion Laboratory and development partnership with Lockheed Martin Space Systems, Denver. International contributions for Phoenix are provided by the Canadian Space Agency, the University of Neuchatel (Switzerland), the University of Copenhagen (Denmark), the Max Planck Institute (Germany) and the Finnish Meteorological institute. JPL is a division of the California Institute of Technology in Pasadena.